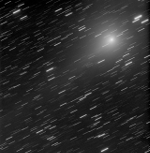 Image of comet C/2018 Y1 (Iwamoto), obtained on 2019 Mar. 5 (20h49-21h19UT) with 15-cm, f/6 Maksutov-Cassegrain astrograph and Canon EOS 6D DSLR. Exposure time was 10x180 seconds at ISO 3200. Total exposure time 30 minutes. FOV is 2.29o x 1.52o. Image scale is 6.0 arc sec/pixel. Copyright © 2019 by H. Mikuz, Crni Vrh Observatory. 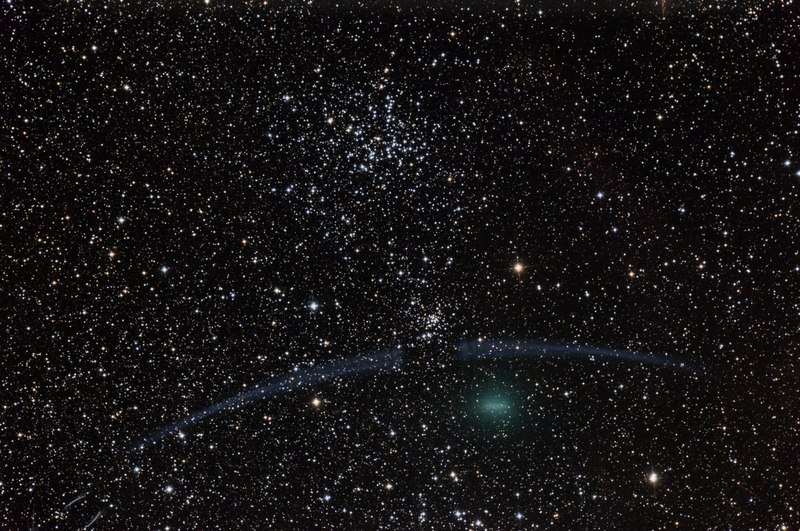 Image of comet C/2018 Y1 (Iwamoto), passing the open clusters M38 and NGC 1907 in Auriga. Obtained on 2019 Feb. 28 (21h40-22h47UT) with 15-cm, f/6 Maksutov-Cassegrain astrograph and Canon EOS 6D DSLR. Exposure time was 22x180 seconds at ISO 3200. Total exposure time 66 minutes. FOV is 2.29o x 1.52o. Image scale is 6.0 arc sec/pixel. There is a ghost reflection between the comet and clusters due to optics design and relative proximity of bright star Capella. 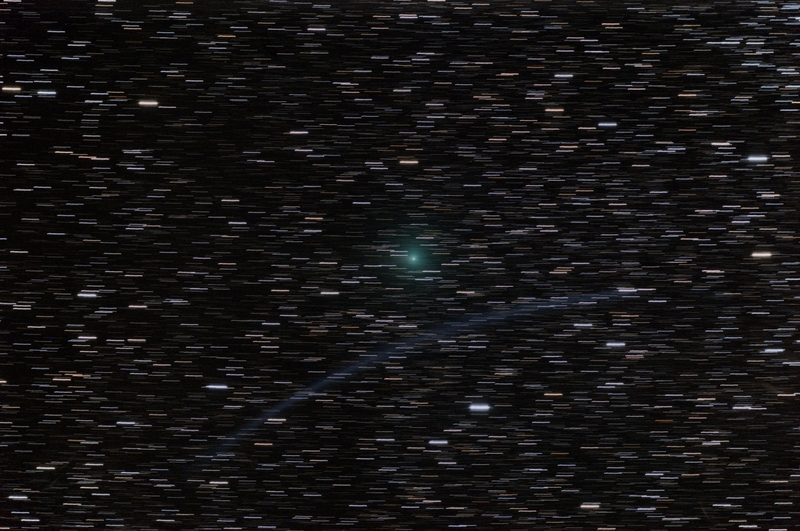 The comet left a fuzzy trail because telescope guiding was on stars. Copyright © 2019 by H. Mikuz, Crni Vrh Observatory. 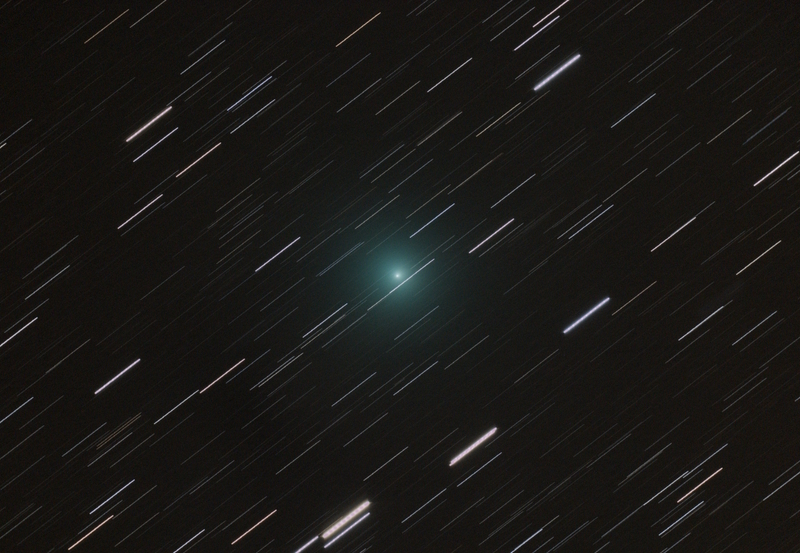 Image of comet C/2018 Y1 (Iwamoto), obtained on 2019 Feb. 27 (20h15-21h00UT) with 15-cm, f/6 Maksutov-Cassegrain astrograph and Canon EOS 6D DSLR. Exposure time was 15x180 seconds at ISO 3200. Total exposure time 45 minutes. FOV is 2.29o x 1.52o. Image scale is 6.0 arc sec/pixel. There is a ghost reflection accross the image due to optics design and relative proximity of bright star Capella. Copyright © 2019 by H. Mikuz, Crni Vrh Observatory. 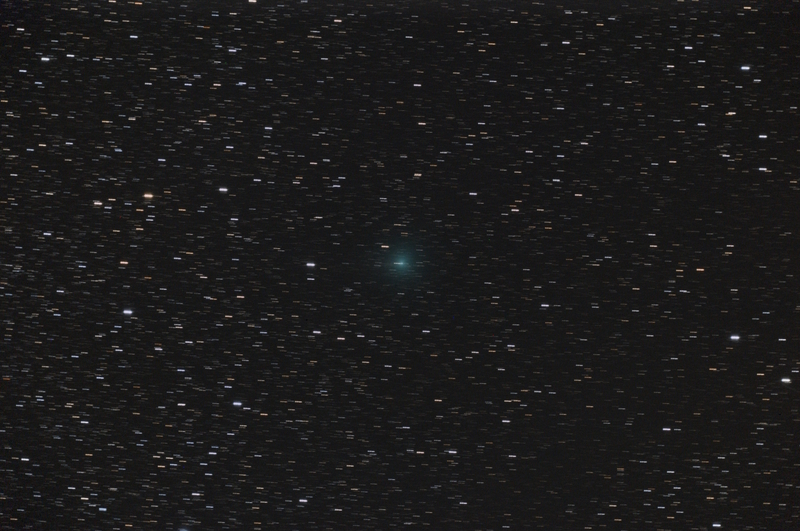 Image of comet C/2018 Y1 (Iwamoto), obtained on 2019 Feb. 25 (19h39-20h18UT) with 15-cm, f/6 Maksutov-Cassegrain astrograph and Canon EOS 6D DSLR. Exposure time was 13x180 seconds at ISO 3200. Total exposure time 39 minutes. FOV is 2.29o x 1.52o. Image scale is 6.0 arc sec/pixel. Copyright © 2019 by H. Mikuz, Crni Vrh Observatory. 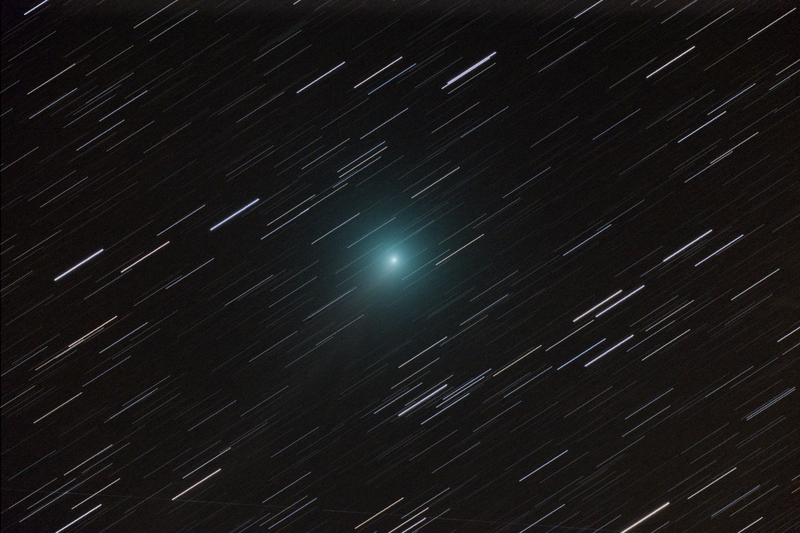 Image of comet C/2018 Y1 (Iwamoto), obtained on 2019 Feb. 15 (2h37-3h08UT) with 15-cm, f/6 Maksutov-Cassegrain astrograph and Canon EOS 6D DSLR. Exposure time was 9x180 seconds at ISO 3200. Total exposure time 27 minutes. FOV is 2.28o x 1.51o. Thin clouds somewhat interfered exposure. Image scale is 6.0 arc sec/pixel. Copyright © 2019 by H. Mikuz, Crni Vrh Observatory. 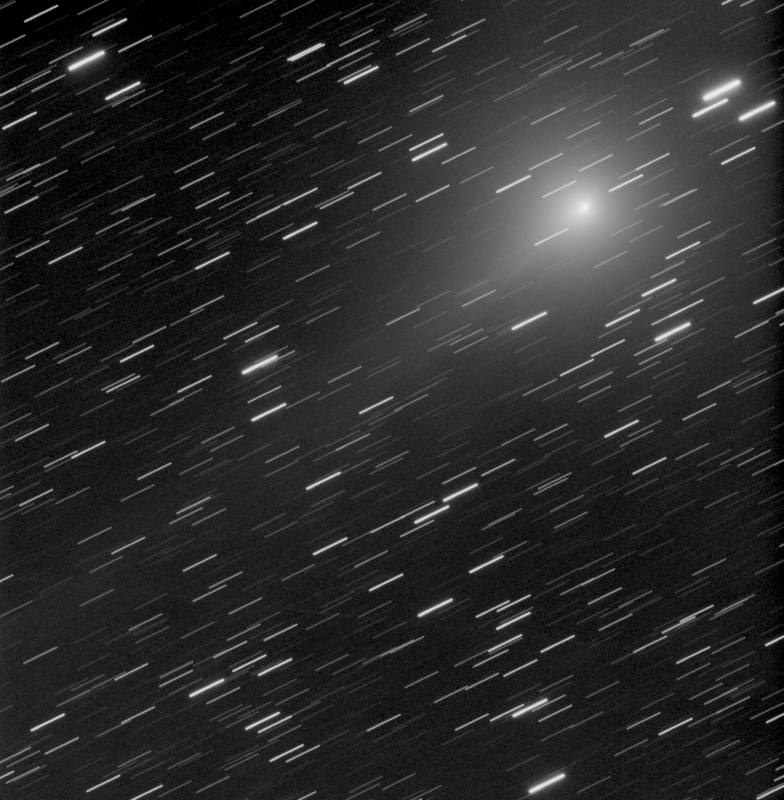 Unfiltered image of comet C/2018 Y1 (Iwamoto), obtained on 2019 Feb. 15 (3h35-3h46UT) with 60-cm, f/3.3 Deltagraph telescope and CCD. Exposure time was 20x20 seconds. Total exposure time 400 seconds. Image scale is 2.5 arc sec/pixel. Copyright © 2019 by H. Mikuz, Crni Vrh Observatory. 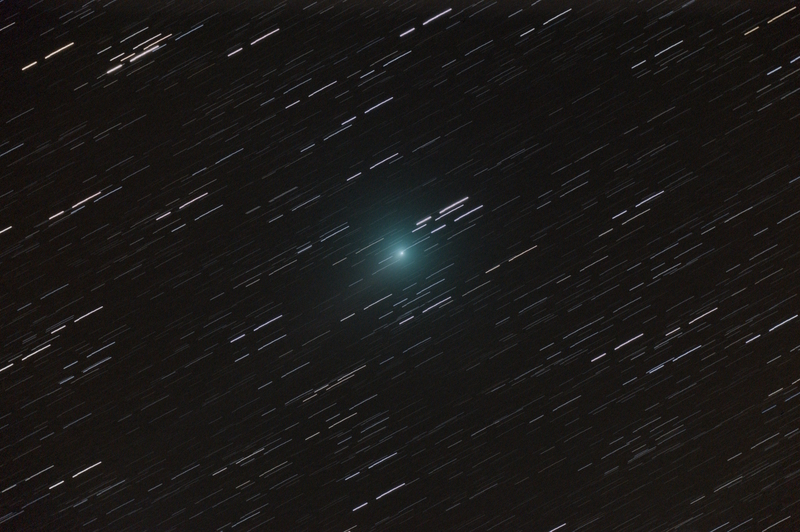 Image of comet C/2018 Y1 (Iwamoto), obtained on 2019 Feb. 13 (3h13-3h43UT) with 15-cm, f/6 Maksutov-Cassegrain astrograph and Canon EOS 6D DSLR. Exposure time was 10x180 seconds at ISO 3200. Total exposure time 30 minutes. FOV is 2.28o x 1.51o. Image scale is 6.0 arc sec/pixel. Copyright © 2019 by H. Mikuz, Crni Vrh Observatory. 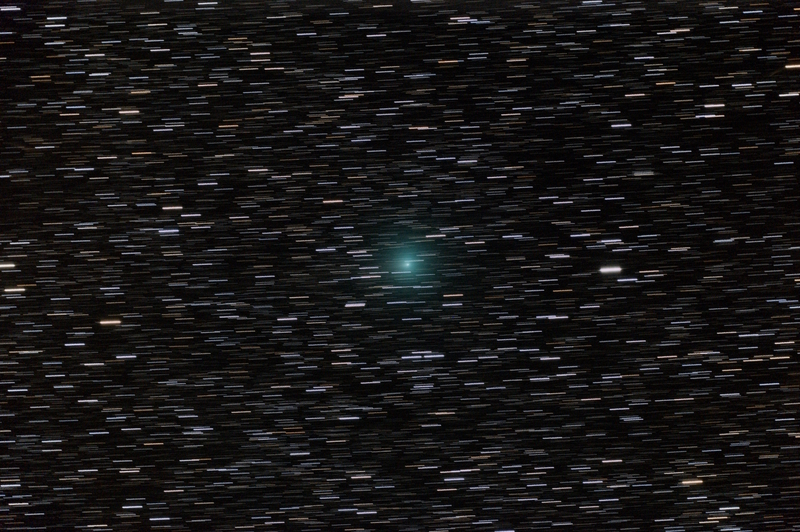 Image of comet C/2018 Y1 (Iwamoto), obtained on 2019 Feb. 8 (23h28-23h58UT) with 15-cm, f/6 Maksutov-Cassegrain astrograph and Canon EOS 6D DSLR. Exposure time was 10x180 seconds at ISO 3200. Total exposure time 30 minutes. FOV is 1.88o x 1.30o. Image scale is 6.0 arc sec/pixel. Copyright © 2019 by H. Mikuz, Crni Vrh Observatory.